Anita is the founder of the Gurgaon Girl Riders, a women’s cycling club in India, and is an amazing woman that I recently had the pleasure of getting to know. When I found out I was traveling to India for business one of the first things I did was start researching opportunities for cycling in Gurgaon. I had a race planned for the week after my trip and really didn’t want to spend a week on the hotel stationary bike. After some Google searches and Facebook research I stumbled upon the Gurgaon Girl Riders and went out on a limb and sent a message to the club explaining that I was looking to get some cycling in while I was on my trip and asked if they could help me point me in the right direction as far as renting a bike. Looking back I can see now how my message immediately gave away how oblivious I was about the state of women’s cycling in India. Naivety aside, Anita immediately blew me away with her generosity, hospitality and kindness. She not only invited me to ride with her group on Saturday and Sunday, she arranged to get me a bike, lights and helmet arranged pick up and drop off for me at my hotel, planned coffee and lunches for us, planned routes for the weekend specifically for me and got me a Gurgaon Girl Riders jersey so I could fit right in with the other girls! Over the next few weeks Anita and I got to know each other via Facebook and I watched as the Gurgaon Girl Riders continue to grow and flourish as a cycling club. It wasn’t until I got to India and rode with the club that I really realized how amazing Anita is. You see, cycling in India is challenging, especially for women. There are many reasons for this, but I’ll try to concisely summarize what I observed and learned during my time there. Infrastructure: It didn’t take long to notice the quality of roads in Gurgaon. I’m pretty sure the term bike lane doesn’t exist in the Indian vernacular and if it did it wouldn’t matter because cars, buses, trucks and motorcycles would be driving all over the bike lanes, which would already be packed with cows, dogs and debris. The road conditions are not ideal and the traffic situation is downright dangerous. Conveniences: Many of the things we take for granted in the US, like having reliable electricity are a challenge in India, even in the developed areas. On the morning of our ride one of the girls was late because she got stuck in the elevator on the 14th floor of her building due to a power outage! Social Expectations for Women: There are many expectations on women in India. India is often described as a patriarchal society, which among other things means that women have many responsibilities at home, therefore, it is rare for women to make time for themselves. They don’t have time to think about trivial matters like cycling. Safety: Sadly Delhi is not a safe place for women to be travelling alone, especially in the dark or at night. Crimes against women are prevalent and real threat that women must be aware of and protect themselves from. Even with all these challenges Anita, who was already an accomplished cyclist and adventurer (she recently hiked to Everest Base Camp!! ), decided to start a women’s cycling club. While there are some coed clubs in Gurgaon and Delhi, Anita recognized that not many women were joining these clubs due to their completive nature and intimidating environment for newcomers. Anita saw the need for a female cycling club and she voluntarily and courageously responded. Anita realized how empowering cycling is and wanted other women to experience this. Many of the women in the club are new to cycling, some don’t even own bikes when they reach out to Anita. She helps them find bicycles and she helps them find mechanics and bike shops to service their bikes. She organizes clinics to teach the women how to take care of their bikes and change flat tires. She arranges SAG support for the rides so everyone is safe and has enough water. Many of the rides are point to point due to the distance that the women can ride before the traffic gets too unbearable so she arranges taxis so all of the women and their bikes can get home safely after the ride. And she rides sweep, making sure that everyone is safe and having fun. It was amazing to watch her in action, calling and texting all of the girls at 4:45 AM to make sure they arrived safely. Making sure everyone was at every checkpoint and doing well and then telling everyone which cab they were taking home afterwards. 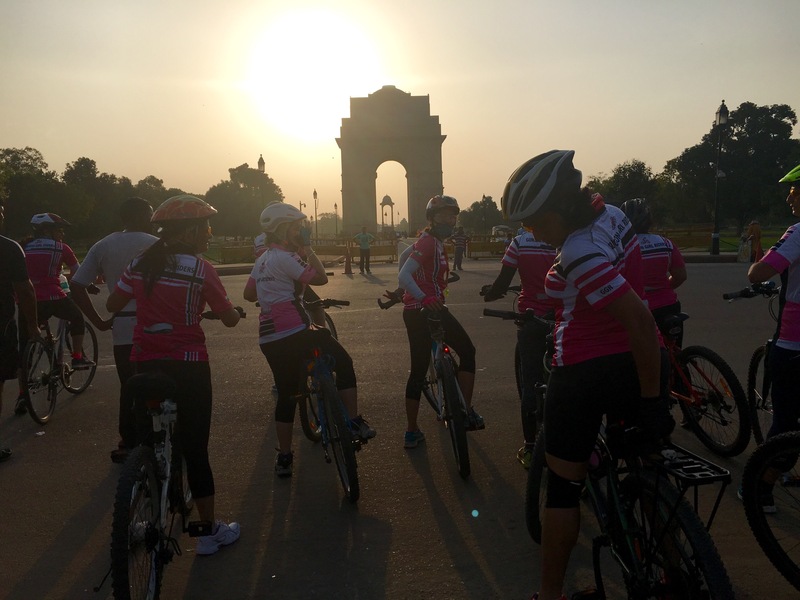 Anita and the Gurgaon Girl Riders are changing the face of cycling in India, and I am so honored that I was able to be a part of it. I will never ever forget the memories I have from riding with them and I look forward to riding with them again in the future. It is my sincere hope that the girl that receives a bike in Anita’s name will experience the freedom, empowerment, calmness and strength that Anita and I both know come from cycling. I hope she will grow to have Anita’s courageous and generous character and I pray that she will have someone like Anita in their life to lift her up and lead her along the way.